I had a day out in York on Saturday. The weather was perfect. The crowds were... ideal for people watching. It didn't really go as planned. The plan was to find the wool shop and treat myself to something woolly. I found the wool shop but nothing caught my eye. I did better with the charity shops, picking up a brand new pair of M&S jeans for £1.39. The man looked at me slightly puzzled. I just smiled. I have no idea why they were priced so low. They weren't an out of date style or damaged. I picked up a couple of travel themed paperback novels. I've got a nice little pile by my bed to get through. It's the next best thing to actually travelling. Talking of which. M and I are going round in circles with the subject of when is it OK to start taking holidays without your mostly grown up children. E will be 19 at Christmas and is talking of going abroad with her boyfriend next year so I feel it's definitely acceptable to go on our own holiday. M thinks this is unkind if it's a destination she'd like. Then there's J who will be 16 at Christmas which is a trickier one, if we take him is that unfair to E? My solution is to be firm and say that we'd like a holiday on our own. So we shall see. Anyway, York. There was a food festival that was extremely crowded. I did try and look like a discerning gin purchaser and tried a sample or two. I sussed out all the potential stalls to buy food but when M was finally free of his conference duties we ended up in a quiet side street with tables on the cobbles outside. I chose a refreshing meal of pesto chicken and avocado on a bed of brown rice. Just my kind of food. Simple but tasty. It was almost like Barcelona for a moment, until a crowd of cackling hen party women turned up and started smoking like chimneys nearby and then it all felt distinctly British once more. 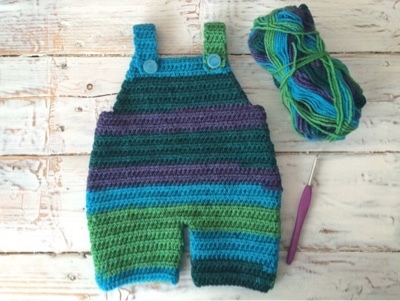 I was recently given a brief to crochet some bright or multi coloured baby boy dungarees. There was actually some similar yarn to that above in York but it was a tad shiny for my liking and looked like it would be a devil to crochet with. I'd forgotten I had two balls of this yarn in my stash and it felt just right for the 'brief'. The Mum-to-be is not the pastel blue kind which has turned out to be rather fun on this occasion. Now all I need to do is make a second pair the same... she's expecting twin boys! It'll probably take me a while but I'm intending to write the pattern up for these, for my own future reference as much as one to share. Whilst the second pair I make will be as above, I shall add a front and back post treble ribbed cuff to the bottom of the trouser legs, and also a front pocket for the pattern version. Thanks to a day of non stop rain I've finished a second elephant. She distinctly feels like a 'she' because she's a fraction smaller. I've cheated on the tassels this time and looped several strands through the 'rug'. Boy was that quicker and less fiddly! I tried a different colour scheme for the blanket edging and tassels and didn't like it so it was back to safe greys! In fact it was actually two days of non stop rain. 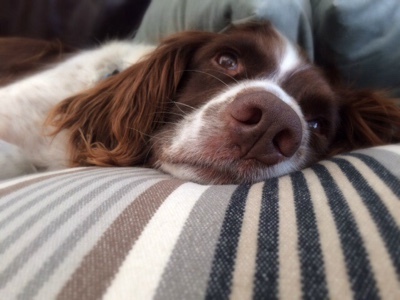 The dogs take themselves off round the fields at the end of the garden on rainy days but it isn't the same as a nice long supervised walk! I made up for it today with a long and leisurely ramble through our favourite meadows and nature reserve. For months I really didn't think my knee would ever recover by itself. It's still problematic and doesn't take very much to knock it into bad shape for a few days. Bizarrely it is still tender to touch, I can't kneel on it, bend down, sit with my feet tucked under my chair, I can't land on it, stairs are painful, slight inclines are painful nevermind hills but... I can walk on the flat and I'm absolutely over the moon about that. If I tread carefully I can do my usual dog walking route albeit with a nagging pain. Never again will I take walking for granted. Harvey still suffers from a deck slipping injury he acquired some years ago. 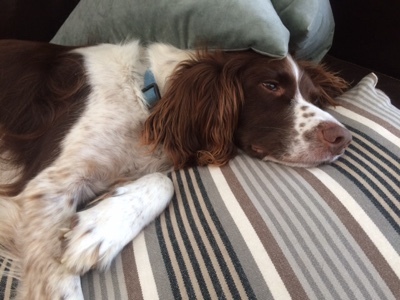 He bounded outside on an icy day and yelped loudly as he slid across a small portion of decking. It must have done some quite severe muscular damage because he's never been the same since. He thinks in much the same way as I do and scorns 'rest'. After a lengthy tennis ball fetching session he limps home triumphantly with soggy tennis ball in mouth. There's no telling how much pain he's in. 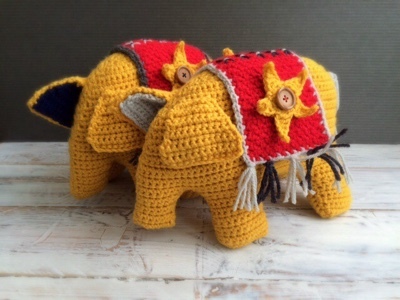 I don't think I'm quite done with crochet elephants yet. I was aiming for two for my craft stall which has meant making three so that the nearly 19 year old in the house who should have grown out of cuddly toys but hasn't, can have one on her bed! Then there's the fourth one that I will make with my niece in mind but that will have to wait as I have a particular colour scheme in mind. Little E visited last weekend which was just fabulous. She really is such a star. It's pretty much the rule that small children are happy, sociable and easily entertained when you take them places and then save their crabby moods for home! I'm sure a certain someone was just like that. As adorable as Little E is I am pretty happy that my two are older now. They are still demanding but in a different way. J for instance, who has been largely anti social until now (partly due to Xbox and partly due to shyness) has started meeting friends in town or at the football ground two villages away. So just when E is suddenly out and about in her little car and freeing my time up hugely, J is suddenly asking for lifts. Unfortunately it's not always practical cost and location wise to tell him to catch a bus, though he does when he can and always with his passport as ID. It makes me quite cross that they don't believe that he's 15 and therefore a half fare, OK so he's almost 6'3 but surely anyone can tell he's not got the worldly manner of an older boy? For now I'm happy to be the taxi for his new found social life. One new driver at a time is plenty thank you. I solved the mystery of the second elephant turning out a little bit smaller... both my 4.5mm and 5mm hooks are blue, with only a subtle shade of difference between them. I must have picked up the 4.5mm for the second one. A happy mistake as it turns out because the stitches are a bit tighter. Well that was an enjoyable make! 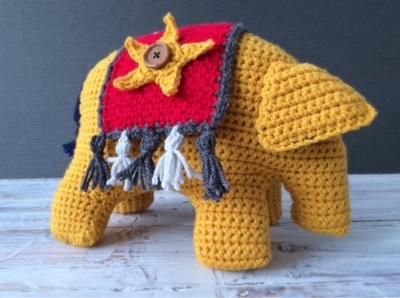 Rather than finish all the extra pieces I decided to sew up the elephant part first. He stood naked for a while until I'd finished the blanket. This is one of those designs that is more 'knitterly' in construction; flat parts, a gusset and then sewing. Not my favourite way of producing an animal but since he's so cheerful I can forgive it just this once. So this fine chap might not make it to market to be sold (at a craft fair) but he will be sticking around as a useful prototype for future reference. Number two is already underway, although he may be made in slightly different colours. I think the two shades of grey were playing it a bit safe, and also those tassels were a bit of a faff, I'm sure there is an easier way to make neater tassels. Maybe I just need practice. My favourite part is the blanket which is done in linen stitch, which doesn't really show up in these photos, but looks satisfyingly 'woven' close up. He's a nice size too at about 12" wide and 8" tall. I scaled him up from DK to Aran. He's very squidgy. The bright yellow is a very welcome colour to be working with today while we have grey overcast skies and constant rain. 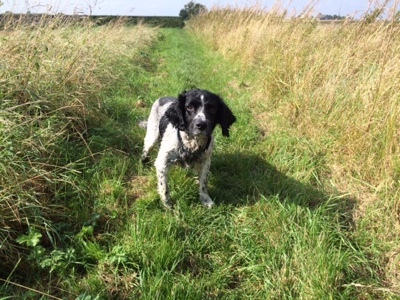 The dogs looked like drowned rats and since they harvested the wheat in our fields they also look like dog scarecrows with straw bits sticking out of their curly ears. 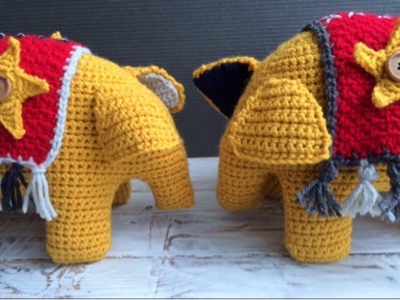 I'm planning on making just two elephants for my craft stall as colourful eye catching items alongside the hats and some jewellery. It's tricky to decide on prices. By the time you've factored in yarn (about 150g), toy stuffing, buttons and safety eyes it doesn't leave a lot of room to take into account the time spent making this toy, so really it's just about the enjoyment of making something and selling it to someone who will enjoy it too. A week or so ago I heard that I'd been allocated a table at a local craft fayre. 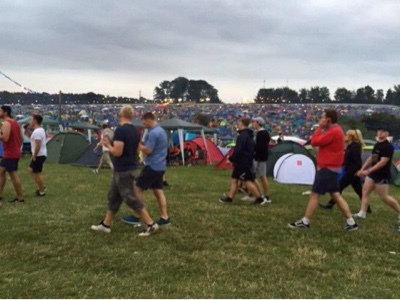 It's a well attended one, held just once a year. Nothing fancy, just a complete mixture of crafts. Of course I'm terrified. I love making things but I do hate selling face to face. It's partly worry that nothing will sell, partly that I will make a giant prat of myself by not being able to converse in a noisy village hall which echoes thanks to the lack of carpet or curtains. Actually that last worry is guaranteed to be the case. M will be my back up ears at least. Let's face it he will make a charming salesperson too. Anyway, I have a month to focus on supplementing the stock I've already made by way of leather/wood/metal jewellery. 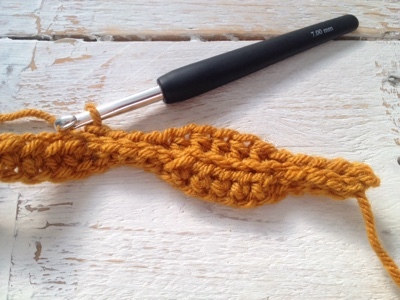 It would be mad not to try a few crochet items right? Something simple like hats maybe? Ugh! Not simple at all given that hat size charts vary wildly across the Internet. Oh well. I've stuck to one and that's all I can do. I've allowed for a bit of give too so they will get a bit of extra time out of it if it's for a growing child. It was a good opportunity to dive into my Aran and chunky supplies and see what could be used up. I picked out all the machine washable yarns and used my wool winder to make neat 'cakes' of what wasn't already wound that way. 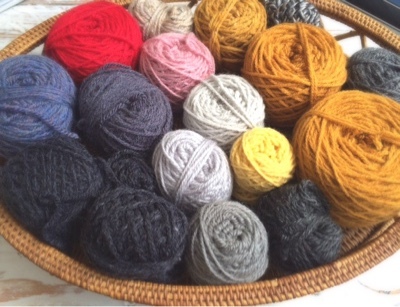 It wasn't a very inspiring colour palette but after a frenzy of woolly hat making I now have a basket tray of each weight leftover. This is superb news! I've been working really hard over the last few years to whittle down my stash. The tiny amounts will probably get made into random pom poms (always useful!). This just leaves me with pure wool and wool blend yarns in more useful quantities which I prefer to work with these days. Fun as they are, my random striped, side to side constructed baby and toddler woolly hats, there comes a time when you can't face making another. 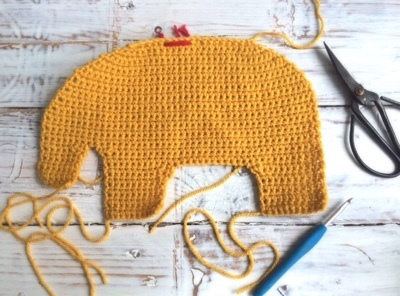 So in complete contrast I decided to make a big yellow elephant! Well biggish, not that big. The pattern calls for DK but I find Aran easier to work with so instead of roughly 8x6 inches he's coming out at 12x8 inches. 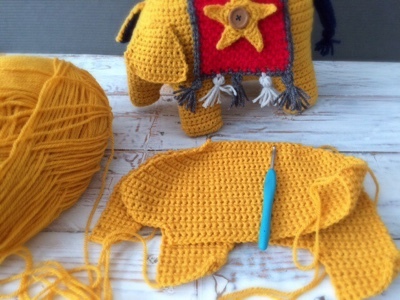 Ella has a weakness for both elephants and the colour yellow so I need to be very firm about his destination ie. 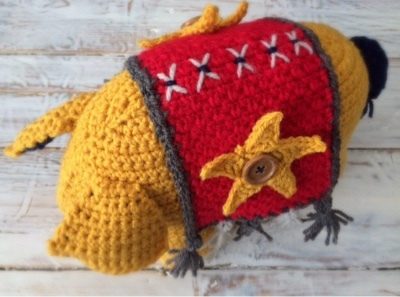 as an eye catching craft stall item! I have Mansfield to thank for the elephant inspiration. M had some legal work to do there this week and said he thought it might be charity shop heaven if I wanted to tag along. There were plenty of charity shops but there was also a haberdashery closing down sale within their department store. I don't usually buy a lot of Rowan yarn, especially if garments are involved but the sale prices meant that I could at long last knit up a cardigan/jacket pattern that I've had for a while but hadn't found a substitute yarn for. It would normally have cost £98 just for the yarn (who buys that stuff?) but I managed to get the required number of balls plus a bit extra just in case for £32. It won't be as enjoyable as crochet but it's the end result that I will enjoy; a chunky, throw it on over anything kind of cardigan. It's also good to refresh my memory where knitting is concerned too! 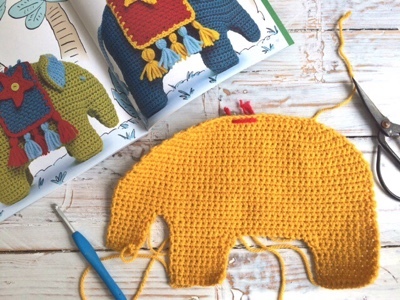 I also picked up the book with the elephant pattern in it for less than half price. 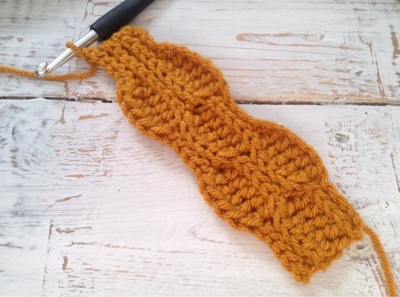 It has been out for years and caught my eye long before I knew how to crochet! 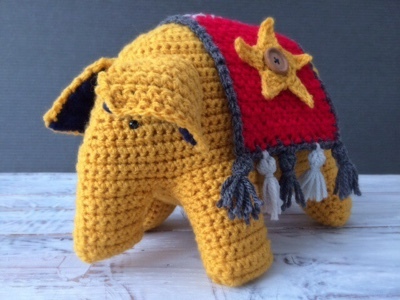 So, it's back to my big yellow elephant now in the dappled shade under our trees, while a certain four legged friend looks at me and sighs every now and then as if to say, 'is it cool enough to go for a walk now?'. We had a heat wave kind of day yesterday and I waited until the temperature had dropped to a milder 24 degrees (from 30!) before attempting to load them up in my car and take them off to the river for a swim. I so wanted to have a paddle too but I'm not so keen after watching a very large grass snake slither into the water a few weeks back. 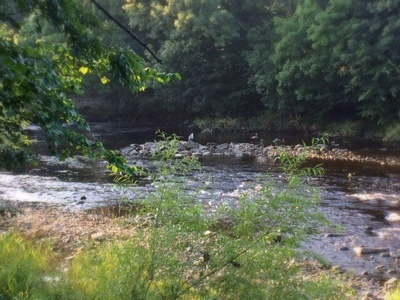 I've been managing to walk a bit further with my dodgy knee and hoping to see my Heron. Finally the other day I saw not one but two! Shout if there's a mistake! I'm no pattern writer but I've given it a go. The beauty of this style of constructing a hat is that you can choose any yarn weight you have to hand along with these guide measurements. 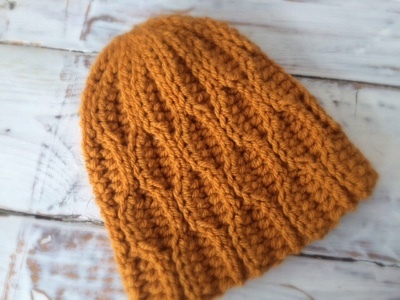 I like working with Aran or worsted weight which is how I made the oatmeal coloured honeycomb hat. The baby/toddler sized red hat (see previous post) was made using chunky yarn. As a very approximate guide I use a starting chain which measures 11" or 12" for an adult hat with a turn up brim. For a child's hat I would use a chain of 7" or 8". If you increase these dimensions you get a bit more of a slouchy hat or a deeper turn up. 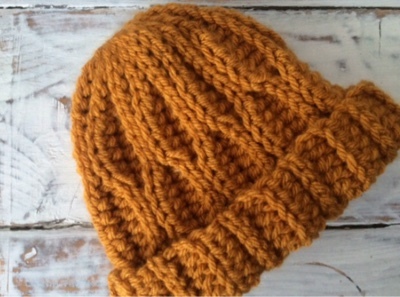 An adult sized hat can be made using less than 100g of Aran weight yarn. The child sized one in chunky, I have found, uses slightly over 50g. 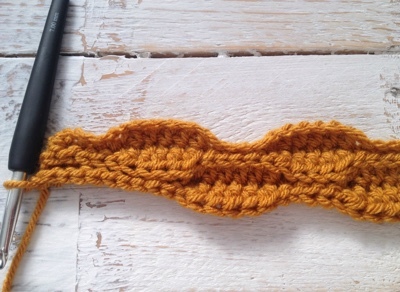 The best way to get to grips with how this honeycomb pattern works is to make a small baby/toddler hat with a starting chain of 25 using chunky yarn and a 7mm hook. This should produce a chain of approximately 8" long. Work through the back loop (tbl) throughout. 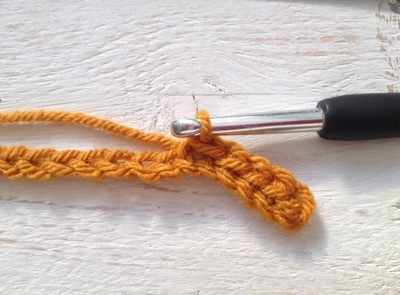 Ch1 and Ch2 at beginning of rows are turning chains and do not count as stitches throughout. Row 2: (rs) ch1. (5 sl st, 5 htr) twice. 5 sl st. Turn. Row 3: (ws) ch1. (5 sl st, 5 htr) twice, 5 sl st. Turn. Row 5 ch2, (5 htr, 5 sl st) twice. 5 sl st. Turn. 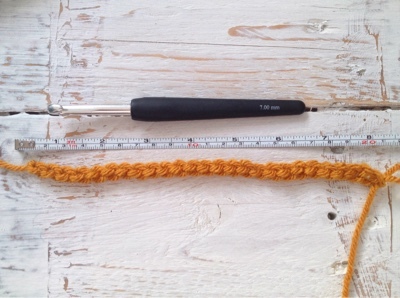 Repeat rows 2-5 until piece measures approximately 16" at widest part. Sew seam with wrong sides together. Gather stitches at top and secure on wrong side. For adult hat: chain 40 or 45 using Aran weight yarn and 5.5mm hook. 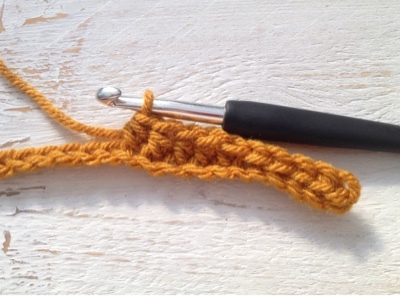 The chain should be roughly 11" or 12" long if you want either a slouchy beanie or a beanie with a turn up brim. Adjust accordingly if you just require a well fitted beanie with no turn up! 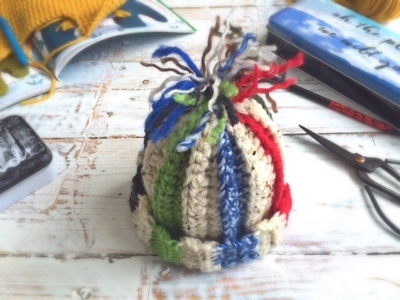 If you've made the small hat as a trial run you'll know how the pattern works, just remember to sl st five stitches at the crown of the hat which makes it taper nicely and a little easier to gather. 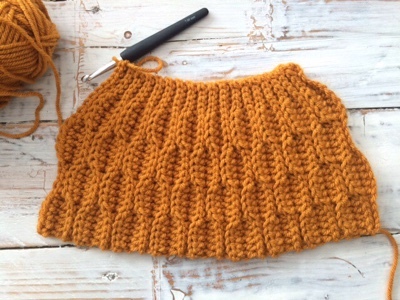 For an adult hat you'll need to repeat the pattern until the width, at the widest part, measures approx 18-20" depending on head size. As a guide my oatmeal honeycomb hat measured 18" before sewing up and my head is roughly 22" in diameter. With the give in the yarn this is an ideal fit. Sadly, no, I haven't disappeared on a round the world trip. I'm still here. M and I managed to fit in a few nights away last week. There are still great big pockets of ignorance when it comes to my knowledge of all things Northern. When M mentioned Bradford I must admit I wasn't exactly filled with joy, it conjured up rather a different picture to that of camping bliss. However, Bradford was where M needed to be for a couple of days so we eventually found a site that had space (should have taken that as a sign!). We arrived in a picture box village with beautiful window boxes everywhere, a lovely pub, a babbling brook... and a dreadful camp site with communal showers! The least said about the rest of it the better! Thank goodness we bumped into another couple who were also just leaving who recommended a nicer site five miles away. M made a phone call and phew, they had a space if we were quick. We were quick. The site was terraced and it was a devil to get a long caravan pitched but it was well worth the effort because it looked out over hills and dales and the most amazing sunset every evening. My head was obviously not in blog mode because I didn't take a photograph! Argh! We were somewhere between Otley and Ilkley and the countryside was wonderful. Despite work in Bradford we managed a nice morning in Ilkley just browsing book shops and drinking coffee and chatting to small children... we concluded that M must have a friendly face because, on two separate occasions, a small child decided to strike up a conversation with him. In a cafe, a three year old, clearly bored with her mother and grandmother's conversation turned around in her chair and said, 'Hi, I'm Lucy'. When M cheerfully replied, 'Well it's very nice to meet you Lucy' she had an attack of shyness but recovered enough after a minute or two to have another go. The other small child introduced herself as Bella. M agreed with her opinion that it was a very nice name. He explained that we had a daughter called Ella which sounded a bit similar (she disagreed) but that we sometimes call her, EllaBella. This was clearly the funniest thing she had ever heard and she went off chuckling heartily. Indeed, EllaBella is doing the festival thing as I write. On the one hand it fills me with worry and on the other I am secretly glad that she is spending five nights in a tent and experiencing the delights of a single camping stove with no refrigeration facilities. This is a girl who would choose a hotel over wild camping any day of the week, unlike her Mother. I dug out my Trangia cook set complete with meths burner. A visit to a camp shop for a new bottle of meths informed me that wow, these sets have gone drastically up in price since I bought mine, oops, that must have been at least 15-20 years ago. Jeez, time flies. I held out the set in front of E and asked her to guess how many cooking things it might contain (bear in mind the whole thing is about the size of a medium saucepan). She was miles off. I unpacked the three saucepans, the frying pan, the kettle and the windbreak/pan stand/burner unit, the meths burner and the handle for the pans and she did concede that it was pretty amazing. 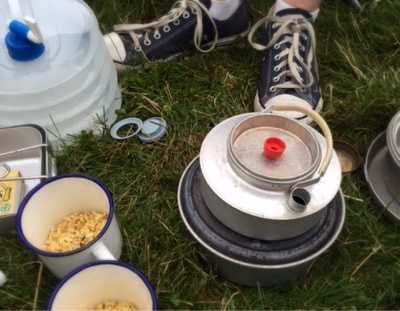 Still not convinced that this tiny gold pot would heat enough water for an espresso let alone a pot noodle I had to do a demonstration on the patio. If this failed then she'd be paying £5 for a small frankfurter in a roll for her main meal every day (apparently this was the cheapest food at last year's festival). Not only was she surprised that it boiled a kettle of water, she was surprised that it was quick. So last night I received the above pic, including boyfriends feet, of the stove boiling water for their packet pasta with the message, 'this thing is actually working!' Thank goodness these kids will never need real survival skills! I don't fancy their chances of making a shelter or starting a fire without matches. 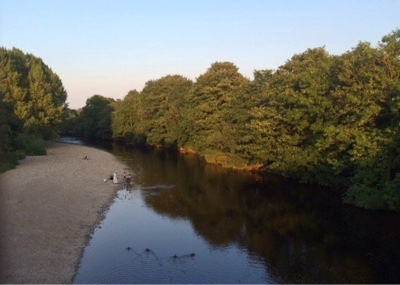 All the river pictures were taken on a warm evening in Ilkley. I had to try and walk off a pint of cider (I'm such a lightweight these days). Unfortunately I kept pointing out that everything was 'lovely' but with a dodgy Northern accent, it wasn't my finest moment. Thankfully I kept quiet when a friendly older couple walked by and M had the most interesting conversation with them about the area. They were both Ilkley born and bred and still taking romantic, hand in hand, riverside walks after goodness knows how many years together (I think they were at least eighty). Their accents were almost indecipherable for me so M had to translate so that I didn't look like a complete idiot. 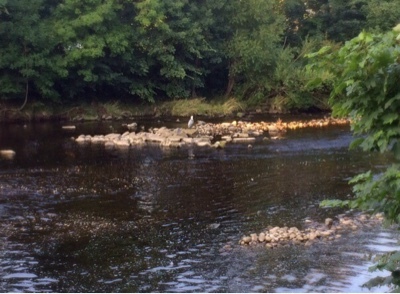 Apparently the Heron was often at the same spot. They were also keen to let us know that if we came back in May then the woods 'o'er yonder' would be a carpet of bluebells. Oo, I bet those two had plenty of tales to tell!